Coonawarra: The history, the vignerons & the wines. The Fortunes of Samuel Wynn. Winemaker Humanist Zionist. WYNN S. (By A. Wynn). Notes of an Australian Vine Grower. Transl. with preface and notes by C.B. Thornton-Smith. Sydney 23rd August - 3rd September. Four Guide-Books to Excursions to (1): The Hunter River District; (2): Yass-Canberra and the Murrumbidgee Irrigation Area; (3): The Illawarra District; (4): The Sydney District. 4 vols. Wine is Fun - So is Cooking with Wine. (AUSTRALIAN WINE PRODUCERS OF N.S.W.). The Subtle Alchemist: a book of wine. RAINBIRD George & Ronald SEARLE. (The Fear of Wine). Being the J. K. Walker Lecture for 1953 for the Wine and Food Society of N.S.W. Foreword by Frank Louat. N. S. W. The Case Against Prohibition. A Sensible Survey from Various Points of View. Something in the Cellar... Ronald Searle's Wonderful World of Wine. The Illustrated Winespeak. 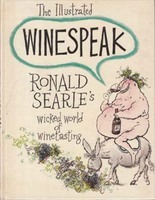 Ronald Searle's wicked world of winetasting. The State Mine: A Pictorial History of the Powlett Coalfields. Federation Number (Vol. XII: Pt. 1). Ed. by W. H. Clarke. AGRICULTURAL GAZETTE OF NEW SOUTH WALES The. Diesel's Engine. Volume One: From Conception to 1918. By C. Lyle Cummins Jr.
Lyndoch: Gateway to the Barossa Valley. Vintage Festival (April 14th-18th) 1971. Miners in the 1970s: A Narrative History of the Miners Federation.